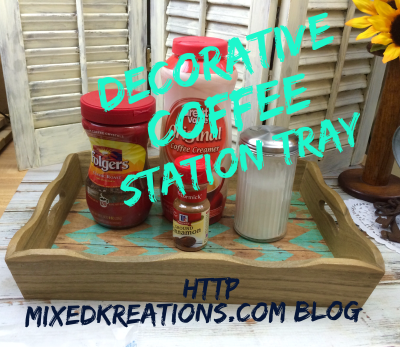 I made this Decorative Coffee Station Tray to solve the problem of a messy kitchen counter top. The hubby loves his coffee but is bad about spreading his coffee fixin’s all over the counter top. So with his own decorative coffee station tray he keeps all his fixin’s neat and organized. First off find you a wood tray, then sand it if needed. 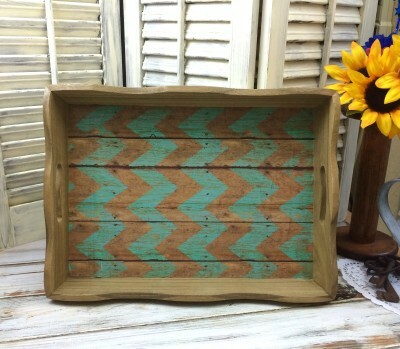 Take some scrapbook paper and position in the bottom of your tray. Crease the edge with your fingernail so you will know where to trim off any excess paper. For this tray I used my wood aging solution to age my tray. You could stain, or paint it, which ever you desire. (I’m sorry back when my site crashed I lost some of the pictures in my tutorial). Cover the bottom of the tray with Mod Podge then lay your scrapbook paper down working from one corner lining edges up. Working out any wrinkles as you go until it’s all glued down. 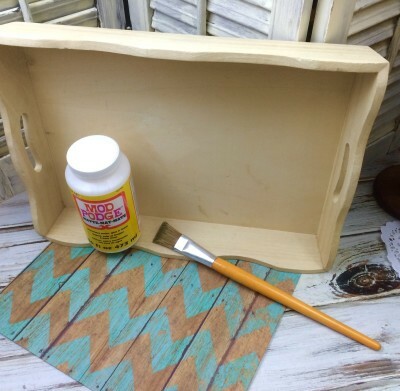 Let dry then add a coat of Mod Podge over the whole tray to help seal and protect it. There you have it a pretty Diy decorative coffee station tray to keep all your coffee fixin’s neat an organized. To clean gently wipe with a slightly damp rag. This is so cute! I think a tray is a great idea for an office or church where you might be moving the coffee station. Thanks for sharing the idea! Thanks Paige! Yes this coffee tray would be great anywhere, there is so many different scrapbook paper to choose from to make the tray fit in anywhere. What a cute, simple DIY! I am moving in October after I get married and this is definitely an idea I’ll keep in mind. Thank you of sharing. Thanks Natalie, and I wish you the best in your marriage. Thanks Jaime! It is easy, I’m sure you would have no problem making one. Rowan recently posted…My Magic Chocolate Pud! That’s super cute! And simple. I can make this! This is so cute and so creative. For sure it would make the morning coffee so much more inviting. Love this. Thank you Jamie! It does keep everything neat and orderly. Instead of spread all over the counter. Love it! I have been brainstorming my own DIY coffee station. I like to do things on the cheap, so I need to stumble across the right kind of tray. I also love using mod podge and scrapbook paper. I did a post about using it on your light switch covers! Thank you Elizabeth! I remember seeing some switch covers with the scrapbook paper, planning on trying that out soon. I found my tray at the Goodwill. Thank you Mandi! I thought that scrapbook paper would look great wit the color of the wood. Cute! I really like the design you did on it. I love this! I also have seen some blog posts recently for coffee carts and counters, instead of bar carts. This would go great with those! When I first saw the scrapbook paper, I thought that it was the actual bottom of the tray and that you did a cool paint/treatment to it. 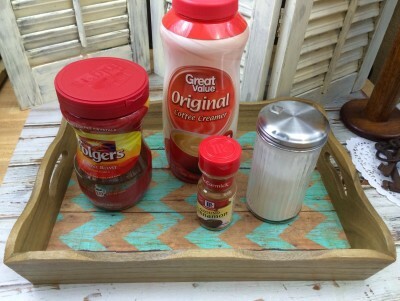 Very cool tray and i love that it is so easy to make! Thanks Dana! I had thought about using my chevron stencil, but decided scrapbook paper would be easier. What a great DIY project. We host an annual Easter Egg Hunt & Brunch and this could be just perfect for that as well. I love that not only is this a beautiful addition to your kitchen on a daily basis but can be used for special occasions too. Thanks for the idea! Rebekah Hamblen recently posted…Berry Orange Coconut Kefir Smoothie: Dairy Free Probiotics! This is a great DIY! It’s those little touches that really stand out, especially when it comes to entertaining and hosting. Love it! Linda, this is a great idea! I’m the one that gets the coffee fixins all over the counter. My husband would love this! We are forever wiping up after me! LOL And I am a huge lover of chevrons, so this is perfect! Thanks Nikki! I’m not a coffee drinker, but the hubby is and he is always making a mess so this has really helped him keep it all organized. 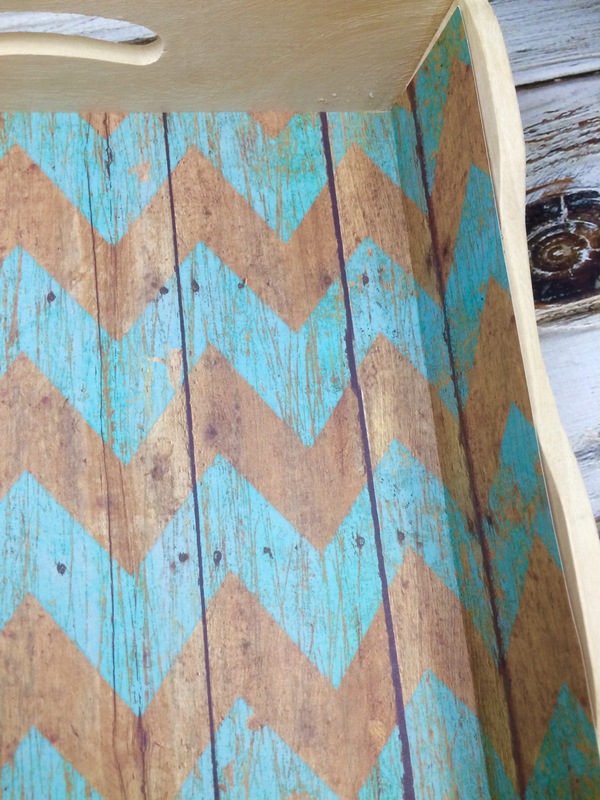 I love the chevron patterns and the different shades of turquoise. So when I seen this pattern and color thought it would be perfect.